Today is a BBC Radio Scotland day and we are celebrating Halloween in Scotland, which means turnips (or neeps) not pumpkins. Well it used to when I was a child. Nowadays all the supermarkets fairly groan under the weight of the ubiquitous pumpkin, but way back in the 60s and 70s the humble turnip was the star of the show. The whole Jack O’landern legend goes way back in time and traces its roots back to Ireland when a sneaky sort called Stingy Jack took on the devil and played games with him over the years. When he died God wouldn’t have him into heaven and the devil wouldn’t have him in hell but threw a burning coal at him, so he was destined to live out eternity walking the earth on 31st October with the burning coal which he put inside a hollowed out turnip so he could see in the dark. One of the recipes I’m sharing today is this quirky yet strangly tasty Turnip Jam. I know, who’d make jam from a turnip, well I just had to try and the results are surprisingly good, especially in a turnip jam tart! So set those pumpkins aside for one year and embrace the humble turnip. 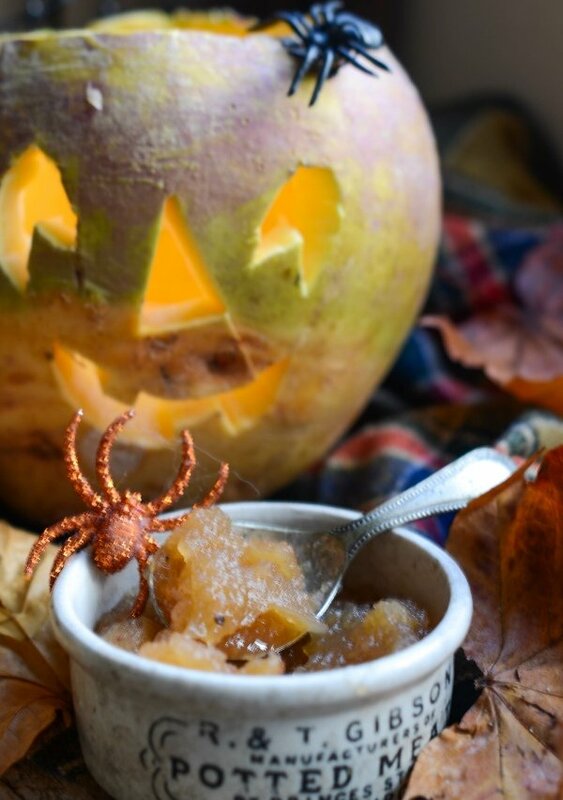 Hollow one out and give him a candle, make some turnip jam and pickles (come back tomorrow) and let’s celebrate Halloween with a wee bit of Scottish style! Peel and chop the turnip into small pieces and put into a heavy based pan with the water, lemon juice and zest and all spices and salt. Bring to the boil then simmer for 20 minutes till turnips are tender. Use a potato masher to squich them down in the pan. Raise the temperature and boil to setting point. Spoon into 3 small jars, cover with a waxed disc and pop on the lids. think I will skip the turnip jam but I will take your challenge and buy a turnip to turn into a Scottish Jack O’Lantern! Trawl through my jam recipes, I do like odd flavours and partnerships so you might find some other things to try out. Trying this for the first time..will post results!!! What do i pair this with?? ok so i made this..its ok but not the WOW i wanted!!! great with poultry as a chutney.